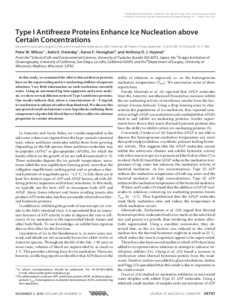 In this study, we examined the effects that antifreeze proteins have on the supercooling and ice-nucleating abilities of aqueous solutions. Very little information on such nucleation currently exists. Using an automated lag time apparatus and a new analysis, we show several dilution series of Type I antifreeze proteins. Our results indicate that, above a concentration of ∼8 mg/ml, ice nucleation is enhanced rather than hindered. We discuss this unexpected result and present a new hypothesis outlining three components of polar fish blood that we believe affect its solution properties in certain situations.